-Driver substitutes for all other symbols except scattered lights. Green Light prize is doubled when one or more. Divers substitute in a winning combination, as indicated. -All symbols pay Left to Right except scattered Lights, which pay any. -When 2 or more scattered Lights appear each will turn either red or green. -Scatter prizes are paid for 2 or more Green Lights only. Wins on different lines are added. Green Light scatter wins are added to line wins. -Scatter wins are multiplied by total bet. Line wins inmultiplied by bet per line. -Highest win only on each line. Maximum win per paid spin is 40,000 times bet per line. -Scatter prizes are paid for 2 or more Green Lights only. 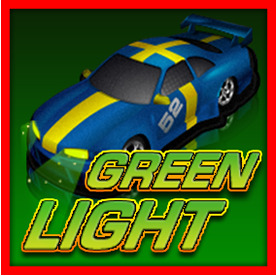 -If 3 or more Green Lights occur the racing feature is triggered. The Player picks from the 5 cars that are revealed and the cars then race. -25, 20, 15, 10 or 5 free game are awarded for 1st to 5th place, respectively. -If the player's car finishes 1st or 2nd another race occurs. -100, 50, 25, 10 or 5 times the triggering bet is awarded in this race for 1st to 5th place, respectively. -Prize are double during the free games feature. The feature can be retriggered. Free games are played at the lines and bet of the triggering game. -Can be won at the conclusion of any game. The Jackpot is triggered at random.Progressive Jackpot wins are added to other wins.